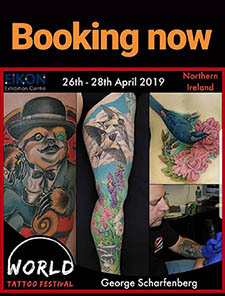 I will be working at this years first World Tattoo Festival in Northern Ireland. It will be hosting 300 Artist over this 3 day event. I am taking bookings now for this show. If you'd like to get tattooed by me here get in contact through my website. I'd love to hear your ideas. There is limited space so hurry if you would like to book. My website is in the link.